When it comes to eCommerce, there’s so much emphasis on the customer experience, but more important to that is the employee experience. Vineet Nayer, former CEO of HCL Technologies, explains in his TED talk that no matter what widget or service you sell, the unique value your company offers is found where your customers and employees meet. It only makes sense that a company that takes care of its employees would develop employees that take care of their customers. Offering true omnichannel commerce takes an army of people behind the scenes — web developers, manufacturers, integration experts, shipping companies, fulfillment providers, etc. etc. Think of all the employees along the supply chain making it possible for your customers to enjoy your products. While many of these people will never report directly to you, it’s worth getting to know the culture of the companies you choose as partners. In a time when unemployment is at a record low and labor shortages are making headlines, employee satisfaction and retention is crucial. We all know employee turnover can be painful. Not only is it costly, it quite possibly could lead to quality control issues. The idea of positive reinforcement isn’t new. We reward our children for a job well done and give our dogs treats for being obedient. This simple act is just as impactful with our colleagues in the workplace…although it can easily be overlooked when a paycheck is involved. Yes, we are paid to do a job, but being told we are doing it well has tremendous value. “It’s sometimes easy for us on the outside to assume the job is easy, but our Distribution Center staff is working hard to meet customer service metrics in a warehouse environment. They are held highly accountable for their jobs, so when they do something well, it needs to be acknowledged,” says Jessica Neill, HR Manager at Distribution Management. Many businesses develop strategies and SOPs around activities that directly impact revenue and customer engagement. I challenge you to change your mindset and realize that employee engagement and morale actually rank higher and act as the foundation to activities related to revenue. 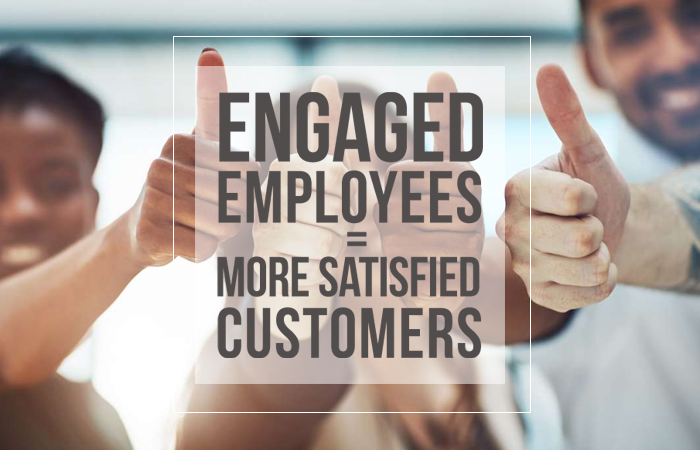 You can’t have a successful business without engaged employees. “As an HR management team, we chose to follow the FISH! Philosophy. It’s based on principals that employees at all levels can appreciate and respect. Plus, it aligns with our ‘work hard, play hard’ mentality, and we’ve seen a significant reduction in turnover since deploying the program,” explains Rachel Freeman, HRIS Specialist at Distribution Management. Having such a generationally diverse workforce allows businesses to see multiple perspectives that can lead to new ideas and growth. However, it also presents challenges. Baby boomers who are nearing the end of their careers might have very different philosophies about work and expectations than the Gen Z’ers just starting out. It’s up to management teams to recognize these differences rather than ignore them. Mutual respect is a big part of employee satisfaction and it has to start from the top to keep turnover low, morale high and productivity optimized. “Transparency is the key. Our executive team shares our short-term and long-term visions and goals with our employees as often as possible. We ask them to jump in the boat with us and row hard in the same direction. People are more willing to work hard when they know what they’re working toward. We’ve been doing it this way for 20 years and it works,” explains Sean Fleming, CEO at Distribution Management. If you’re in the business of eCommerce and hiring 3rd party service providers, you might find multiple companies with similar service offerings. Pricing might be pretty close too, but what’s often overlooked is what’s going on below the surface of those organizations. Ask questions about the company culture and employee experience. It will speak volumes about the quality of a company and will have a very real impact on the quality of the service you’ll receive after the contract is signed.